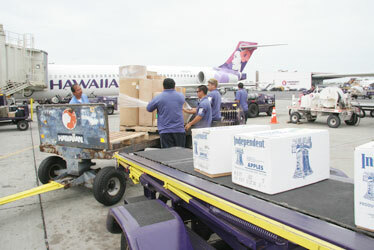 Hawaiian Airlines' cargo area at Honolulu Airport was bustling yesterday as workers loaded freight aboard a Kauai-bound jet. The uncertainty that has threatened Hawaii's airport operations and disrupted interisland air cargo shipments might be resolved today in what could be a dramatic twist in the Aloha Airlines bankruptcy case. Aloha and its lender, GMAC Commercial Finance LLC, plan to ask federal Bankruptcy Court Judge Lloyd King in a hearing today to expedite the closing of Aloha's aviation contract services unit to Los Angeles-based Pacific Air Cargo, according to a person familiar with the situation. The contract services unit handles ground operations for virtually all of the major domestic and international carriers flying into the state. In addition, the cargo operation, shut down Monday, could be resurrected by Seattle-based Saltchuk Resources without Aloha's pilots and possibly begin flying this afternoon, according to the source. Saltchuk, the parent of interisland ocean shipper Young Bros., has offered $10.5 million, plus $4 million of accounts receivable, and has been told by the Federal Aviation Administration that its operating certificate would be expedited, the source said. Meanwhile, freight-forwarding businesses and the Hawaii Superferry are bridging the gap left by the closing of Aloha Air's cargo services, and Pacific Air Cargo will soon be shuttling large amounts of refrigerated perishables on a Boeing 727 scheduled to arrive last night from the mainland. In what could be a climactic ending to the Aloha Airlines bankruptcy case, the sale of the company's aviation contract services division could be finalized as early as today, while its cargo operation could be resurrected and possibly begin flying this afternoon without Aloha's pilots, according to a person close to the situation. Ramp agent Justin Nishimura rearranged passenger and freight cargo yesterday aboard a Hawaiian Airlines plane that would soon be headed for Kauai. Aloha Airlines and its lender, GMAC Commercial Finance LLC, plan to ask federal Bankruptcy Court Judge Lloyd King today to expedite the closing of the contract services unit to Los Angeles-based Pacific Air Cargo, the source said. And in the latest twist involving Aloha's cargo operations, the same source said that Aloha and GMAC are close to having a signed letter of intent from Seattle-based Saltchuk Resources, parent company of interisland ocean shipper Young Bros.
That deal with Saltchuk, which walked away last week from bidding for the cargo unit, would be for $10.5 million, plus $4 million of accounts receivable. Even though GMAC had at one point requested $20 million from Saltchuk, the second-highest bidder at $13 million, the source said that GMAC was willing to accept a lesser amount now because the Federal Aviation Administration said it is willing to expedite the certification necessary to run cargo. Saltchuk would operate under Aloha's operating certificate until Saltchuk can obtain its own certificate in about two weeks, the source said. Unlike the high bidder -- Jupiter Holdings Group LLC, which had bid $13.65 million -- Saltchuk has experience in cargo through its operation of Northern Air Cargo in Alaska. The bidding results were dropped when the case was converted to a Chapter 7 liquidation from a Chapter 11 reorganization. Cargo agent Michael Loo was among workers at Honolulu Airport yesterday loading freight aboard a Hawaiian Airlines jet bound for Kauai. Meanwhile, if newly appointed Chapter 7 trustee Dane Field does not approve the expedited sale of the contract services unit to Pacific Air Cargo, then Aloha and GMAC plan to ask King to order that the sale be approved by Carol Muranaka, assistant U.S. trustee for the District of Hawaii, according to the source. The contract services deal, for $2.05 million, plus accounts receivable, had been scheduled to close this Monday to allow for a 10-day objection period. But given the possible effect that any suspension of contract services work could have on the state's economy, the parties are seeking that the deal close today. Aloha's contract services unit, which handles ground operations for virtually all of the major domestic and international carriers flying into the state, performs such functions as ticketing and assisting passengers, baggage handling, directing planes to gates and cleaning aircraft. Those carriers affected are United Airlines, American Airlines, US Airways, Japan Airlines, Air Canada, Korean Air and China Airlines. Pacific Air Cargo also plans to pay the contract services employees who have been working since the case was converted to Chapter 7 on Monday, the source said. Furthermore, GMAC has asked Field, the trustee, to release $100,000 in payroll at First Hawaiian Bank that has been earmarked to pay the contract services employees. Field has been threatening to resign over a pay dispute and because the unsecured creditors are faced with not receiving any money from the asset sales, according to people familiar with situation. Sources also have said that Muranaka, the assistant U.S. trustee who appointed Field, is planning to file a motion to dismiss the case. Such a move would remove the stay that has kept creditors from suing Aloha and would enable various parties to work out deals outside the auspices of Bankruptcy Court. Muranaka said yesterday she could neither confirm nor deny whether she planned to file such a motion. She also declined to comment on whether Field planned to resign as trustee. Field did not return phone calls.